...in Monterrey and will be scouting painting sites tomorrow. The Carmel Art Festival is a short fire event, just two days to paint, so I don't want to waste time puttering around. 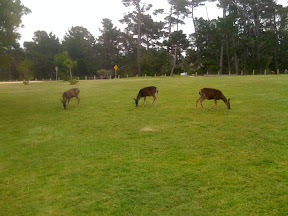 I'm up in my favorite campground at the top of the peninsula, where Monterrey deer come crop the grass every night. Love to see them gather in the moonlight. Even saw a Minnie with two little ones still in their spots. Up at the crack of dawn to get going! Glad you arrived in one piece...oh that long journey. Will be following and waiting with baited breath!